AMD's Ryzen Threadripper 2990WX crushes multi-threaded tasks like we've never seen before. Stop, AMD. You had us at 32-core, 64-thread Ryzen Threadripper 2990WX consumer CPU. You didn’t have to make it better by saying this weapon of thread destruction could be ours for $1,799 (available on NeweggRemove non-product link or Amazon)—just $76 more than what Intel wanted us to pony up for its 10-core Core i7-6950X two years ago. In Millennialese: That. Is. Just. Freaking. Insane. But before you invest too much thought or cash into the concept of a 32-core CPU sitting in your PC at home, there’s a lot of caveats you need to know. Simply put: This CPU may be too much power for most of us. A Ryzen Threadripper 2990WX locked, cocked, and ready to crush multi-threaded benchmarks. 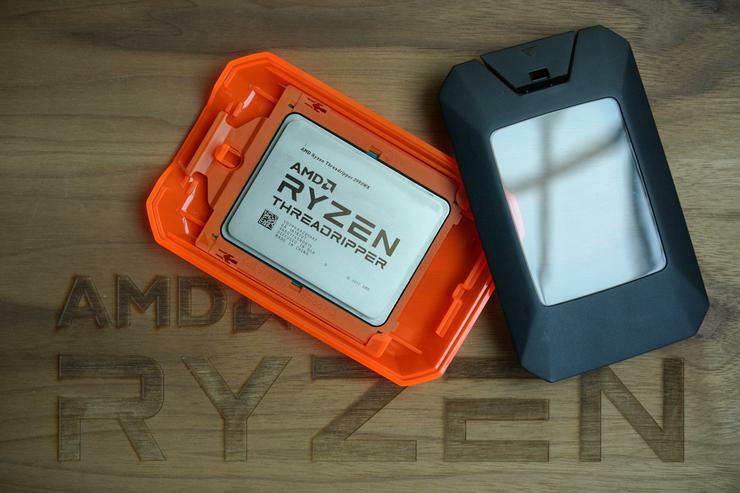 What is Ryzen Threadripper 2990WX? 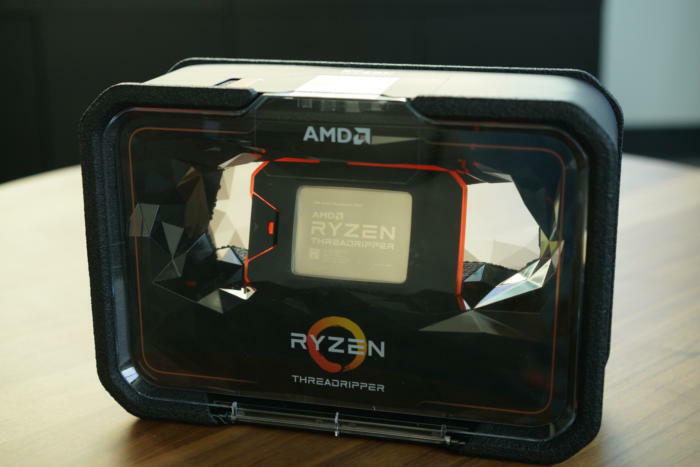 If you’re wondering just how AMD went from an 8-core Ryzen 7 1800X to a 16-core Ryzen Threadripper 1950 to a 32-core Ryzen Threadripper 2990WX in the space of 16 months, while it took Intel three years just to go from a 6-core Core i7 to a 10-core Core i7, the magic is in the design. AMD has four new 2nd-generation Threadrippers on tap, but only one you can order today. What makes a 32-core Theadripper even possible is the multi-chip design. Rather than the single contiguous or monolithic die approach that Intel takes, AMD CPUs are multiple chips joined together by its high-speed Infinity Fabric. The original 16-core Ryzen Threadripper 1950X joined two 8-core chips together. 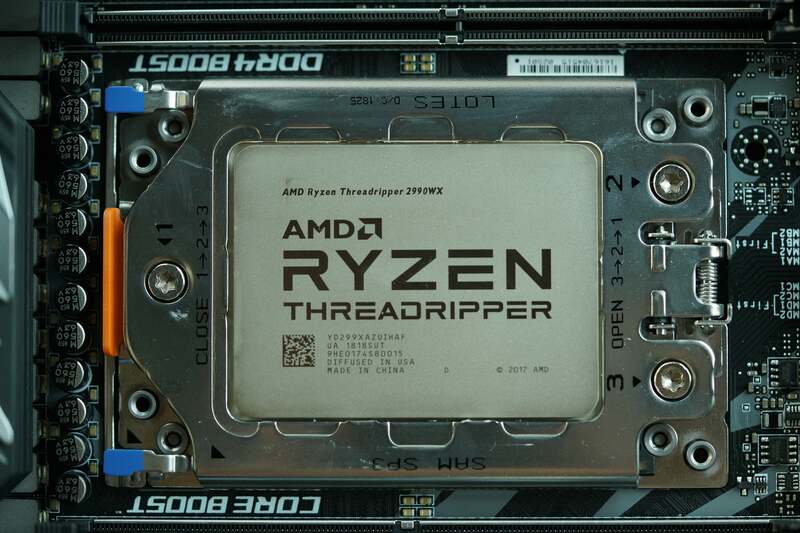 With the 32-core Ryzen Threadripper 2990X AMD joins four 8-core chips together. The 16-core Ryzen Threadripper 2950X features two active dies which each have their own memory and PCIe access. This method comes with its own special penalty, though. Although the sTR4 socket for Threadripper is physically the same as the server socket used for AMD's Epyc CPUs, sTR4 is wired to support four-channel memory using two of the dies, rather than eight-channel memory using four dies. 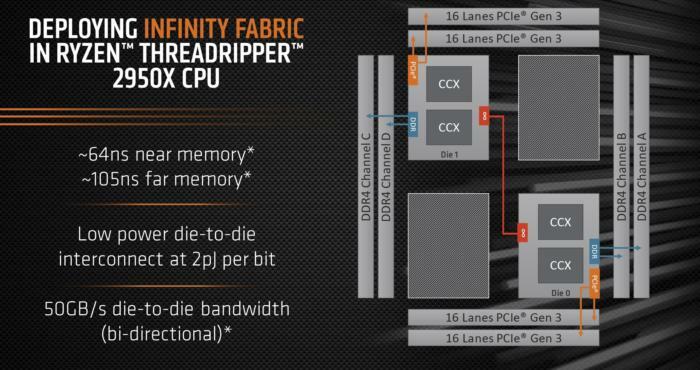 On Threadripper, that essentially means that of the four dies in the 2990WX, two are pure compute-only dies, without direct access to memory and to PCIe. Those two compute dies must talk through an I/O die that has PCIe and access to the memory. This design means an I/O die with memory access has 64ns of latency to memory, while a compute-only die has a latency of 105ns. The new 32-core Ryzen Threadripper 2990WX features four dies connected by Infinity Fabric. Two of those dies must access RAM and storage through an adjacent die. There’s also a reduction in bandwidth across the Infinity Fabric. 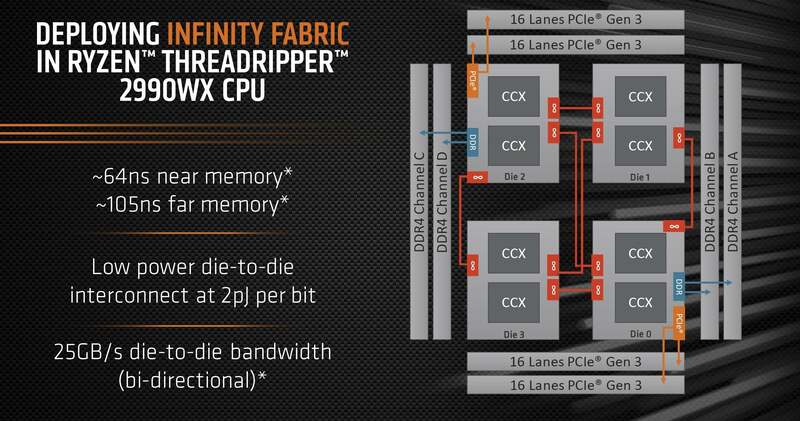 On the new 16-core Ryzen Threadripper 2950X, which uses just two dies, the bi-directional die-to-die bandwidth is 50GBps. On the four chip, 32-core 2990WX, the bi-directional die-to-die bandwidth is halved to 25GBps. What that multi-chip design does do is enable core-count scaling at a rate unseen before. With Intel’s monolithic design, an 18-core CPU would require that every single die be nearly perfect and all of the cores functional to be sold. With Threadripper, to get to 32 cores, it just needs four functional 8-core dies. This all adds up to the crazy number of cores now available to consumers. 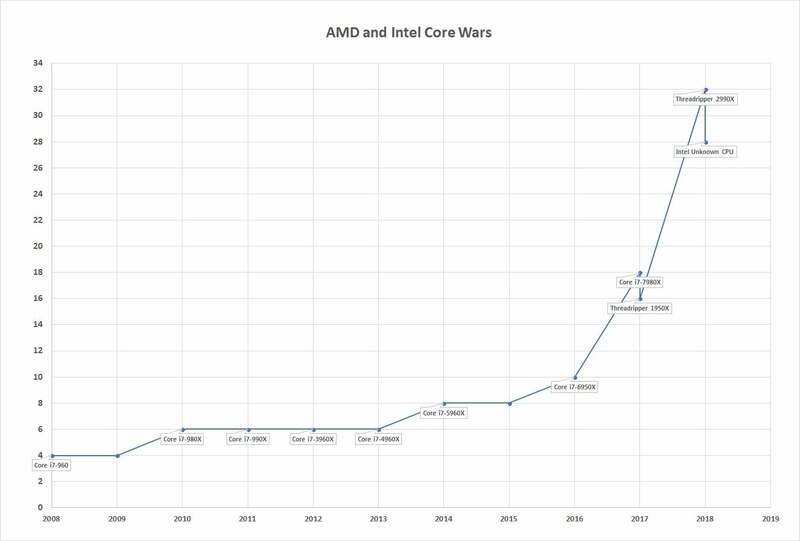 AMD has called this the “Ryzen Effect,” and you can see this on the chart below, where we mapped out Intel’s major CPU launches over the years and how many cores they’ve had. So what caused that spike in core counts in the last year and a half? It took Intel from 2008 to 2016 to go from 6 cores to 10 cores. It’s taken AMD 18 months to from 8 cores to 32 cores. The Ryzen Effect is in full swing. Ever since the introduction of the AMD’s Ryzen CPUs in 2017, core counts of CPUs have taken off like an F-22 Raptor. With the 2nd gen Threadripper, there was much hand-wringing that the CPUs might not work with the existing X399 motherboards. AMD has said every single X399 board available today will work once you’ve updated the UEFI/BIOS to support the newer chip. All of the X399 motherboards support “BIOS Back” features, which let you update a board’s BIOS via USB without requiring an older CPU. While all of today’s motherboards will work, they might not all overclock the same—but even there the news is mostly good. AMD said the main issue is the massive power draw of the 32-core and 24-core versions of the chip, so some board vendors have beefed up existing boards by offering cooling kits. A snazzy new lunchbox-sized case comes with the new CPU. How fast is it? Keep reading to see our performance benchmarks.